The Cats are Coming! The Cats are Coming! So apparently Mom has gone and done it again. It's mutiny, I tell you. This time she has given Patches permission to promote a cat litter Twitter Party on my blog. Has she read the title of this blog? I just don't understand these two. 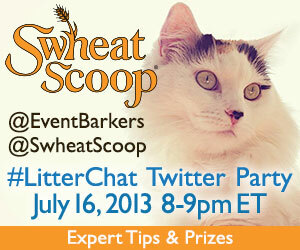 Mom, Patches and Miss Paris' crew at CatTipper.com are collaborating with Swheat Scoop on a #LitterChat Twitter Party. It's that super Eco-friendly, naturally-processed kitty litter that Mom loves because it is not so dusty when she fills the box. I guess Mom sneezes less when she uses it so that's one benefit. She says there are more, and we should watch for her posts about the green features of Swheat Scoop. is on the badge you see here. As usual, Mom's badge did not cover important stuff like why and how, so I've got a few more details to share before I hit the publish button and tell Patches to skedaddle. Just like the cool dog products we do Twitter Parties for, apparently this kitty litter is widely used and popular with the felines and their families. So Mom and Paris plan to share that news along with tips on kittybox issues. I have a kittybox issue; I'm not allowed to go near it. That's definitely an issue! To me that kitty box looks like a salad bar, full of little protein nuggets. I really don't quite understand Mom's logic, but she tells me that that's Patches space and I must respect it. I have to admit that she rewards me well when I do what she asks. Anytime she sees me watching Patches in her private space without entering, Mom gives me a super yummy Natural Balance treat. We have a nice assortment here since they sponsor All Things Dog Blog. Partnerships have their perks, but I digress. Mom says I'm supposed to invite you all to join us for the party where you'll get lots of litterbox tips (Will she share how I can get to it without being scolded? ), info about Swheat Scoop and its benefits, and some really hot prizes. She hasn't told me what the prizes are yet, but I peeked so I'm going to spill. Mom, Paris and the Swheat Scoop folks have collected some pretty slick stuff, if you're a cat, that is. They've got a fancy-schmancy scratching tower for bird watching, litterbox organizers and accessories, some expensive, high class litter boxes for picky kitties, and most important, they've got a ton of Swheat Scoop cat litter. Come a little closer so I can whisper. They're actually going to give away a year's worth of kitty litter to the Grand Prize winner, and that winner gets more great cat stuff. There's even toys! Oh oh! Tanner heard me say that out loud. He's coming, so I'm hitting the publish button and hiding. He'll be looking all over for the toys. Don't forget you have to sign up at the RSVP form at All Things Dog Blog. I don't really get that whole RSVP thing. Hopefully you do. Good luck with your cat party; I hope I can get out of it. I'm really not into Tweeting about kitty products, ya know?